We P.G. 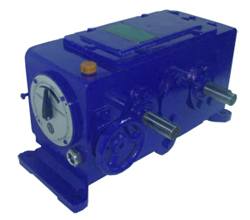 Drive are Manufacturers, Exporters & Leading Suppliers of PIV Gearboxes Located in Mumbai, India. • Simple maintenance and high efficiency that enables economical solutions, even in continuous operation, and high speed setting accuracy. • The features of the 'torque converter' permit high torques at small speeds. • High system protection for operation in dirty environments. “PIV stands for "Positive Infinitely Variable" drive, the name given to a power transmission system using a slatted steel chain. The P.G Drive’s (PG–U series) gear is the 'classic' infinitely variable speed gear units.The simple and efficient PIV variator is a good alternative to an electric drive: from machine tools to paper production lines, from packaging machines to pump drives. Due to the negligible power losses the variator performs with very high efficiency, even when running under partial load.